The Marina Torch, also known as Dubai Torch or just The Torch,is a supertall residential skyscraper at the Dubai Marina, in Dubai, United Arab Emirates. 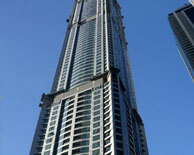 The tower became the tallest residential building in the world in 2011, surpassing Q1, in Gold Coast, Australia. The tower reaches 336.1 m (1105 ft) in height with 79 floors above ground. The original design by Dubai-based architects Khatib & Alami was 74 floors, with three basement levels and a four-story podium, and had a total planned built up area of 111,832 m² (1.2 million ft²). It was to have 504 apartments ranging from one to three bedrooms and four duplex apartment suites. The three basement floors and part of the podium were to hold car parking for 536 vehicles, while floors five and six were to contain a swimming pool, health club, gymnasium, cafeteria, aerobic rooms and sit-out cover seal terraces. In April 2007, the project was running 18 months behind schedule, with the tower's foundations still under construction. The original expected completion date of June 2008 had been extended to late 2009, with the further extension into 2011. The Marina Torch was opened in May 2011.